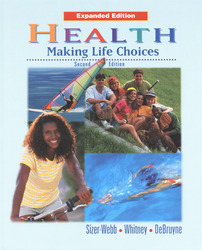 Contains all of the information in Health: Making Life Choices, Regular Edition, PLUS two chapters on understanding sexuality and preventing pregnancy and sexually transmitted diseases. Health: Making Life Choices gives students the important decision-making skills and information they need to promote their own good health. It teaches the self-responsibility and skills needed to allow students to make wise lifestyle choices - the key to living a long and happy life. Topics include: Family Life, Dealing with Conflicts, Alternative Therapies, The Environment and Your Health, Teenagers and Violence, and Refusal Skills. Develops self-responsibility and decision-making skills by providing the background information teens need to promote good health. Two timely and accurate chapters on human sexuality help students understand how to make wise choices and maintain good health. Straight Talk features present topics in a conversational format. Fact or Fiction features at the beginning of each chapter check students’ prior knowledge of timely health topics. Teen Views give students opinions about health topics through the eyes of their peers. Life Choice Inventory features allow students to deal with their favorite topic—themselves!